Ryanair today (21 Aug) announced a new flight partnership with Air Malta, which will allow Ryanair’s 139 million customers to book Air Malta flights on the Ryanair.com website. From today, Maltese customers can browse and book Air Malta flights on 21 new routes from Malta to 8 different countries across Africa, Asia and Europe, including Russia and Tunisia. 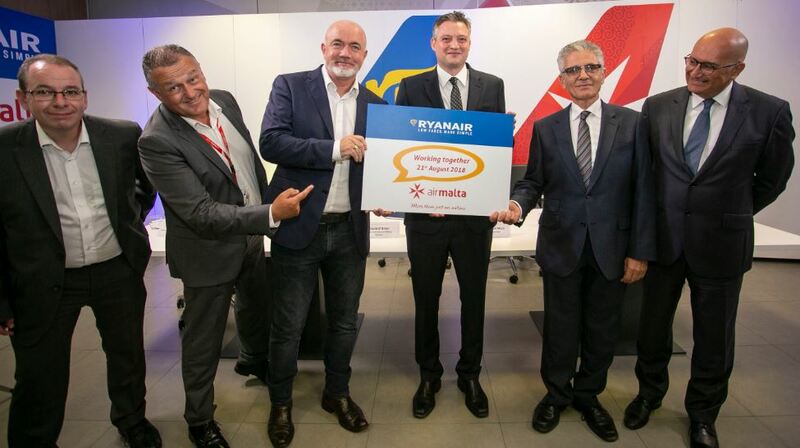 This new Air Malta partnership is the latest initiative delivered under Ryanair’s “Always Getting Better” customer experience programme. Ryanair already offers 53 routes to/from Malta and will deliver 2.7 million annual customers. “We are pleased to announce this exciting partnership with Air Malta, which allows our 139 million customers to browse and book flights on 21 new routes from Malta to exciting cities in Austria, Czechia, Israel, Morocco, Russia, Switzerland, Tunisia and Ukraine, in addition to over 300 existing destinations available on the Ryanair.com website, the world’s largest travel website, which receives over 50m unique visitors every month. “This is a landmark agreement where both airlines are cooperating together for the benefit of their mutual customers. Over the last year, Air Malta has made significant improvements not only to expand its network of destinations with more frequencies and destinations but also changing its product in terms of fare structure and onboard service. This agreement will also help Air Malta increase its visibility in overseas markets and tap into new revenue streams. We look forward to further cooperation between the two airlines for the benefit of our clients”.